There are two types of coordinates for Pfam-ligand interactions: one Pfam and its interacting ligands, and one ligand and its interacting Pfams. Our Pfam domain alignments provide visualization of Pfam domains and its interacting ligands in the entire PDB by clicking PyMOL script files. A PyMOL session displays different ligands in a protein family. Domains are aligned by the PyMOL command "pair_fit" based on the hidden Markov model of a Pfam. Each Pfam domain alignment file (.tar.gz) contains Pfam domain coordinate files (.pfam), four PyMOL script files (.pml), a text file of Pfam ligand clusters, as well as a help file (HowToUsePfamLigandsData.txt). A domain coordinate file is in PDB format, and contains any ligands interacting with the domain. In this folder, there are four PyMOL script files. _byChain.pml is aligned by domains in default mode of PyMOL, but display the entire chains. The segments other than the domains are colored in grey. _byDomain.pml is aligned by domains in default mode of PyMOL. Display only the segments of domains. _pairFit.pml is aligned by domains based on this Pfam hidden Markov mode positions, but display the entire chains. _pairFitDomain.pml is aligned by domains based on this Pfam hidden Markov mode (HMM) positions, but display only the segments of domains. RenameByUnpPfam.pml is to rename the domain name by adding Uniprots and Pfam domains as prefix. All domains are colored in rainbow, from blue to red, from N-terminal to C-terminal. The color can be changed either by modifying the PyMol script files or using commands in PyMol program. The ligand clusters file (ligandClustersInfo.txt) contains the clusters of the pfam interacting ligands in this folder. For the complete list, please search by Pfam ID/Pfam Accession code (http://dunbrack2.fccc.edu/ProtCiD/Search/pfamId.aspx) on the ProtCID web site, then download from Pfam web page. File Chain ID: the chain Id in the coordinate file (.pfam), the correspondence between Asymmetric chain Ids and file chain Ids is lised in Remark 2. Double click one of the PyMOL script file. The representative domain is listed as the first structure in the right panel, then followed by the other domain structures which is sorted in alphabet order. All ligands are selected, with a selection name. (allhet): all ligands in all structures, including those don't interacting with the Pfam domains. (selectLigands): all ligands interacting with any Pfam domains. (cluster_1): cluster 1 of ligands which interact with Pfam domains based on the same Pfam HMM positions. The similarity function is Jaccard index. Cluster method is hierarchical clustering with average linkage (Jaccard score cutoff of merging is 0.4). This is same for all the other clusters (cluster_x). Individual ligands are also selected, with their ligand names as selection names. For instance, (ATP): for the ligand of ATP which are interacting with the Pfam domains. (selectLigands) is displayed in default. You may turn off it by click "H", then select "Hide: everything" in the right panel. You can select any of these selection objects by clicking its name, PyMOL will show the location of the object. If you want to look at one ligand or one cluster, click "A", then "copy to object ", the default name will be obj01. You can change the name by click "A", select "rename object", the "Renaming obj01 to : " will display on the left top of the window. Change the name into any name. You can turn it on or off by click. For a cluster object, you can see the list of ligands by "Display -> sequence" in the main menu (the command window). DO NOT forget to save your PyMOL session (File -> Save Session in main menu). After double click Catalase_pairFitDomain.pml, it shows the Catalase domain alignment and interacting ligands. 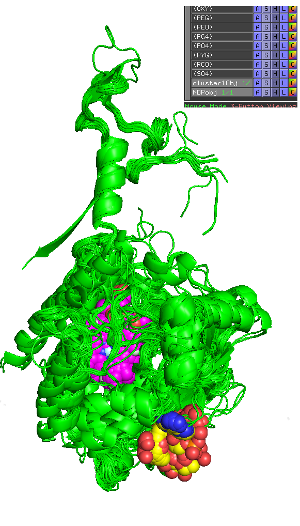 Domains are aligned by Pfam HMM positions, and colored in green. Ligands are colored by element. After selected (Cluster1) and (NDP) ligands by "copy to object" and "rename object", there are two objects cluster1Obj and NDPobj. Hide (selectedLigands) by "Hide everything", then click cluster1Obj and NDPobj to show these two objects. Users can turn on and off these objects by clicking. _byChain.pml and _pairFit files are to display the whole chains but aligned by Pfam domains. These script files are useful when a user want to know whether there are other Pfams in same chain structures. Users can immediately tell whethere there are other Pfam domains in a structure in the PyMOL session. Users can further find out the other Pfams of a chain by searching just this PDB ID or Pfam ID for all structures in the Pfam on Search page. In the returned structures page, column "Chain Pfam Arch" shows whether there are other domains in the same chains. The returned result page will give other Pfam domains and their positions. Users may display other ligands which are not interacting with this Pfam domains, but interacting with other segments of chain structures. Users can select (allhet) by "Show as spheres", and hide interacting ligands by selecting (selectLigands) and "Hide everything". 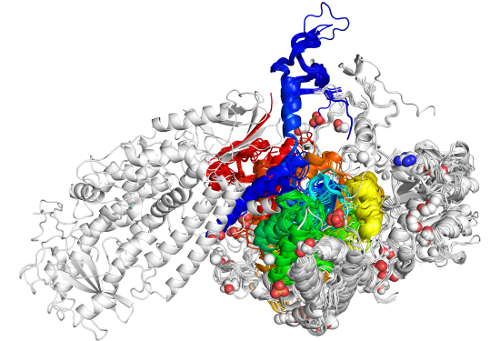 The Pfam domains are colored in rainbow. The segments other than domains are colored in light grey. 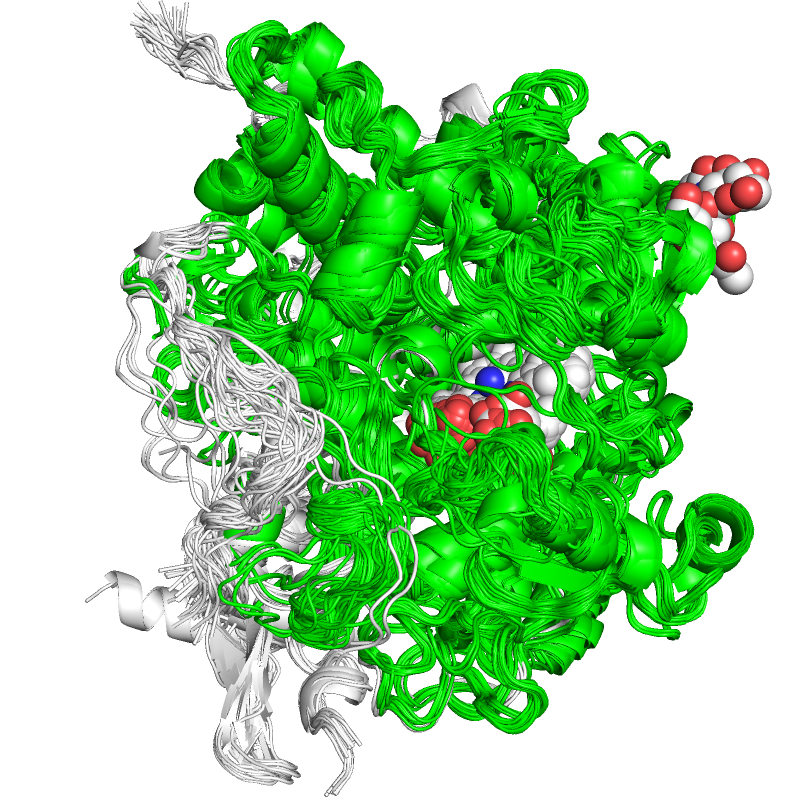 All ligands except water in PDB can be browsed at Browse:Ligands page. The downloadable file is named after a ligand in PDB format, e.g. HEM.tar.gz for heme, and contains all Pfams interact with a ligand. Four PyMol scripts are provided for each Pfam, which are similar to the four PyMol scripts inside a coordinate file of a Pfam and ligands, but only the ligand is selected and shown. After download HEM.tar.gz file from the HEM page, untar the file will list the Pfam domain files and Pymol scripts for each Pfam which interactw with HEM. Click "An_peroxidase_HEM_pairFitDomain.pml" will display the An_peroxidase domains and the HEM ligand. The color can be changed by replacing "spectrum count, rainbow," by "color green, " in the PyMol script, or by Pymol command "color green, chain A". 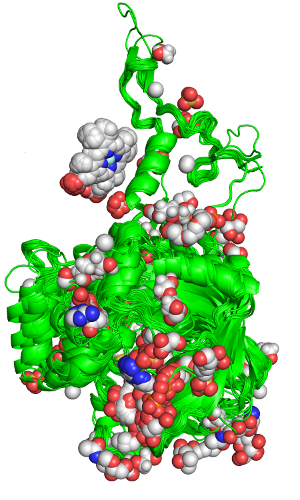 The following picture colors An_peroxidase domains in green. 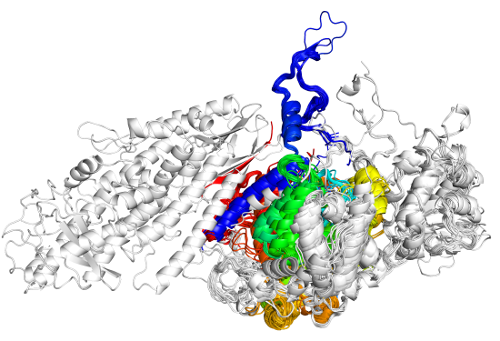 Click "An_peroxidase_HEM_pairFit.pml" will display the An_peroxidase domains, the HEM ligand and the segments other than the domains which are colored in white. The color can be changed by replacing "spectrum count, rainbow," by "color green, " in the PyMol script. 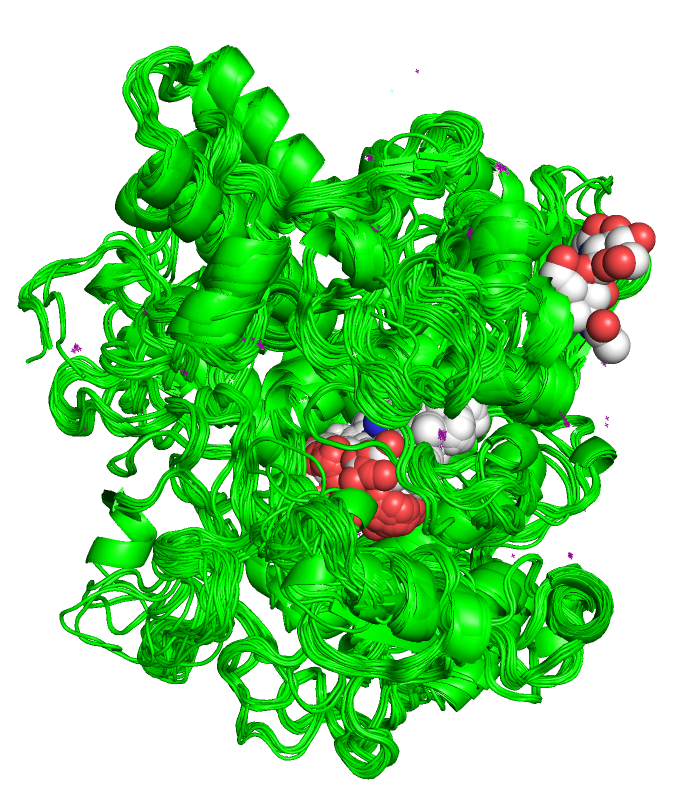 The following picture colors An_peroxidase domains in green, shows other segments other than domains in white.